What are your available training and their schedule? Here is our indicative training calendar. 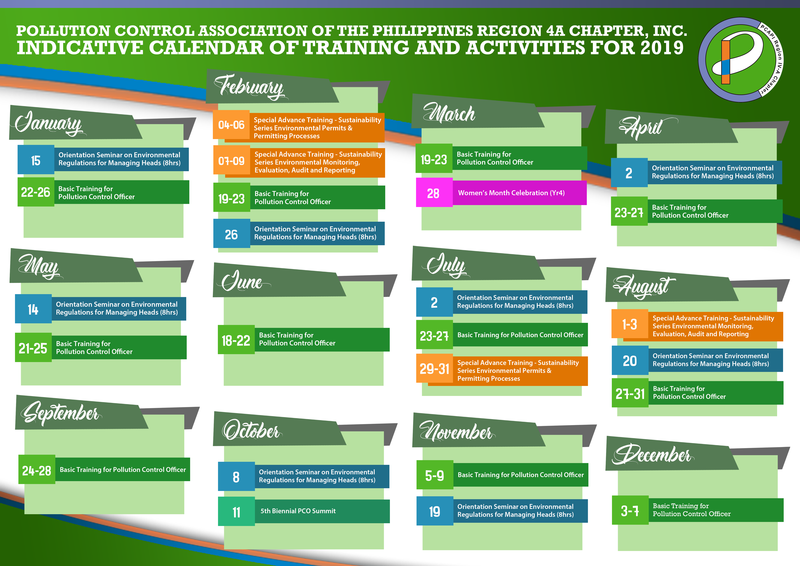 You can see here our posted training schedule for the whole year but it is still subject to changes. For confirmed training schedule, please see Event Page. I cannot open your online registration. What are other ways to register? We always make sure that our online registration is perfectly working. If you cannot access the link, the reason is always almost because it’s being blocked by your wifi connection. Most company wifi has limited access. What you can do is to ask your IT personnel to give you an access or use a different wifi connection. Our slot reservation is through online registration to give a fair chance to everyone who would like to register because our training has limited slots (80 slots). Is your Basic Training applicable to Category A establishments? Yes, this training is for the accreditation of Category A PCOs too. Download Accreditation Form. How will I know if my company is Category A or Category B? You can refer to this file (link to file) to categorize your company. This will be further discussed in the training. For room accommodation, do you provide rooms for single occupancy? If there are, would you know how much it costs per night? The room accommodation that we will provide will be a room sharing for 3 pax. If you wish a solo room, you can register to us as a live-out participant and then check-in on your personal account in the hotel. However, we cannot provide room rates, you have to contact the hotel for direct booking. Can I pay on the day of the training? Yes, you can settle your payment on the day of the training. I am already a pre-registered participant. However, I will not be able to settle my registration on or before the day of the training. Am I not allowed to attend? We will allow you if you will give us a promissory letter stating the promised date of payment. We expect the payment to be settled during the duration of the training or at most, a week after. This letter should have the letterhead of your company and signed by your Accounting or HR Department. I am already a pre-registered participant, can I cancel my online registration? Yes, you may cancel your online registration but not later than 7 calendar days before the training schedule. A communication will be sent thru SMS to confirm your slot reservation. If you already confirmed your slot reservation and then cancel your slot 7 calendar days before or on the day of the training, then you will be charged with reservation fees. Can I use your certificate for accreditation in another region? Yes. Our certificate is valid for accreditation in all regions of the country. Our company is not located in Region 4A, can I attend your training and use your certificate for accreditation in my region? Yes, you can attend our training. Our certificate is valid for accreditation in all regions of the country. Is your registration fee VAT-inclusive? We do not have VAT. Our registration fee is VAT-exclusive. I lost my certificate. Can I request for a new one? We cannot re-issue another original certificate. What we can give you is a certified true copy of your certificate, bearing e-signatures only of the signatories. Please course your request through email. Indicate the following information: Reason of request, complete name and company name, date and venue of training. Once we received your email request, we will need a few days to process it as we still need to verify your information in our database. How many times does the Managing Head need to attend the training. The Managing Head is required to attend the 8-hr Orientation Training only once. His certificate will be valid as long as he will be the Managing Head of the PCO.